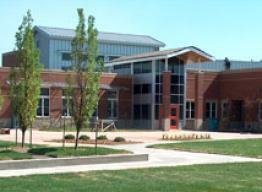 Opened in 2007, Rice Elementary School is an energy efficient, LEED-designed school, named after Edgar Rice, Jr., a long-time educator, administrator, and resident of the Wellington area. Rice’s building-wide behavior plan is based on SOAR: Self-control, Optimism, Appreciation, and Respect. A school garden provides an outdoor learning environment while encouraging healthy food choices. Rice uses PSD’s standards-based curriculum, with instructional delivery focused on inquiry and critical thinking skills. A dedicated science classroom and science Specialist provide materials and tools for extensive science exploration. Weekly art, music, P.E., science, and media-tech classes provide students with well-rounded learning. Extra units of study, such as guitar in music and the traversing wall in P.E., make the specials program unique. After school enrichment programs include classes such as brain games, FITT club, dance, choir, sign language, scrapbooking, and Lego Robotics. The 5th grade technology team films and broadcasts the daily school news.